Should Canadian students be taught with the same history curriculum across the country? I often hear this question posed – sometimes in jest, sometimes in seriousness – at the end of a conference or symposium or in the comments section of an article. It is not currently a very active debate, but this question always seems to teeter on the edge of history education conversations in Canada. History teaches complexity – would greater collaboration across the country lead to more complexity in Canada or less? This year I am writing and editing a series for Active History on History education in Canada. Given that this series runs for eight months rather than thirteen, it will be impossible to feature every province and territory, thus in this post I am going to highlight the collaboration that is a staple in the Social Studies and History curricula in the East and North West and use it to prompt larger questions about the value of common history standards across the country. Each province has jurisdiction over their education curriculum, but New Brunswick, Newfoundland and Labrador, Nova Scotia, Prince Edward Island, Northwest Territories, Nunavut, and Yukon have all collaborated, borrowed, and/or expanded other provinces’ curricula or curricular frameworks. While one can debate the national curriculum standards in theory, these provinces’ adaption of other curricula highlight the regional nature of history and the different needs we have for it. While I’m not opposed to more cohesive national standards (I’m not necessarily supportive of them either), I fear that in practice national history standards will wipe out the regional and provincial specificities rather than bring them into a greater conversation about how Canada can be contemporarily and historically understood. While there are parallels to the overall objectives of the individual courses, what the courses look like and how their specific outcomes are designed are quite different. Take for example the grade 8 course “Canadian Identity.” In Prince Edward Island, this course covers the 1920s to the present in one of five units called “Decades of Change.” This unit is followed by a unit on Citizenship and preceded by a unit on Geography. The same is true in Nova Scotia. In fact, the specific objectives for these units are the same between the two provinces. New Brunswick covers this content in grade 9, but calls the division “themes” rather than “units,” presumably to encourage interdisciplinary – (more on New Brunswick next month). But Newfoundland and Labrador take a different approach. The 90 years between the 1920s and the present are covered over two units, preceded by historical content and followed by historical consideration. This course is organized with more specific unit titles, such as Newfoundland and Labrador from the Turn of the 19th Century through to the Early 20th Century: History as a Story of People , Newfoundland and Labrador from 1914 through 1949: History as a Story of Significant Events, and Newfoundland and Labrador Through the 2nd Half of the 20th Century: History as a Story of Change. While the four provinces are organized under the same Foundations document, from this one example it is clear that some provinces use the Foundations document as a starting point for general Social Studies where Newfoundland and Labrador uses it for a more specific history course – and, judging from the unit titles, an interesting and directed course at that. If the Foundations document did not allow for such tailoring, what would be lost in how the students from these provinces come to know their “Canadian identity”? We see a similar but different phenomenon in the northwest with the territories’ curriculum. By 2020, for example, the Yukon will be completely using British Columbia’s curriculum, whereas Nunavut currently picks and chooses from Northwest Territories, Alberta, and Manitoba to weave together a curriculum that best suits their needs. 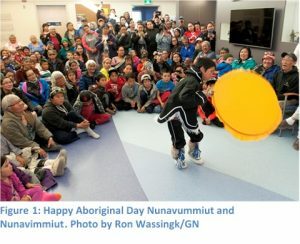 In the future, Alberta’s curriculum revitalization will feature the collaboration of both Nunavut and the Northwest Territories more strongly, but now, in grades 1-10, Nunavut’s Nunavusiutit curricula (covering Heritage & Culture, History, Geography, Environmental Science, and Civics & Economics) follows the Northwest Territories and switches to Alberta in grade 11. In each grade, resources are provided by the Nunavut Department of Education with the expectation that these general curricula will be further locally specified during teaching. One example of these resources is Thunder and Stone: A Module About Inuit Beliefs and the Nattilingmiut. Developed in 2006, Taloyoak – Stories of Thunder and Stone is an archaeological and oral narrative project that provides a holistic understanding of Inuit life and epistemology and was collaboratively developed by Taloyoak elders, students, and archaeologists. This module supports Inuuqatigiit, the NWT Junior Secondary Social Studies Curriculum, and the WNCP learning competencies. The WNCP is the Western Canadian Protocol for Collaboration in Basic Education that developed the Common Curriculum Framework for Social Studies (K-9) in 2002. The Western Canadian Protocol included Alberta, Manitoba, Northwest Territories, Nunavut, Saskatchewan, and Yukon Territory. While Social Studies is listed on their website as a priority, the website has not been active since 2011. This leads to another issue about national curriculum standards: longevity and support – what happens when the money or inclination for collaboration moves on? When looking at the collaboration and adaption of the History and Social Studies curriculum in Canada, the regional nature of history becomes apparent. The locally developed resources highlight more personality that the collaboratively developed standards – be that in the east or northwest. In PEI, for example, one of the listed curriculum documents for history is Classroom Learning Materials for A Play of Black Island History presented by The Old Stock Players. In Nunavut, one unit in the Thunder and Stone module asks students to identify what the purpose of the soul and spirit. Would learning from a play about Black history in PEI be lost if there was more cohesion across Canadian History curriculum? Would learning about soul and spirit remain as part of Social Studies curricula? I’d argue that these uniquenessses would be lost. But I pose a larger question, which I hope gets picked up in the comments: How can these uniqueness be found within Canada? In other words, how can we develop greater curricular and pedagogical practices that invite more collaboration amongst provinces and territories in ways that lead to a greater understanding of Canada’s diversity? 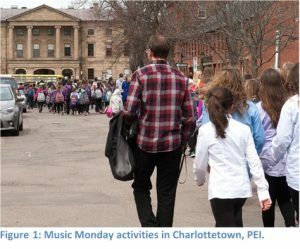 How can students in Alberta, for example, come to understand their connection to Black history in PEI? How can Ontario students come to think about soul and spirit in the history of Canada? These are questions that can enhance how Canada comes to know itself. Do the curricular collaborations in the east and northwest provide a model of how to do this? If you are a teacher teaching in one of these provinces, what is your experience teaching with collaborative curriculum and/or frameworks? Please weigh in below. Also, in 2018 I’ll be pleased to feature some guest writers to this series. If you are interested in writing or being interviewed about a province I have yet to cover please contact me and let me know.